Marie-Thérèse Walter was the third of six of Picasso’s muses and lovers, but she is said to be the woman he loved most. 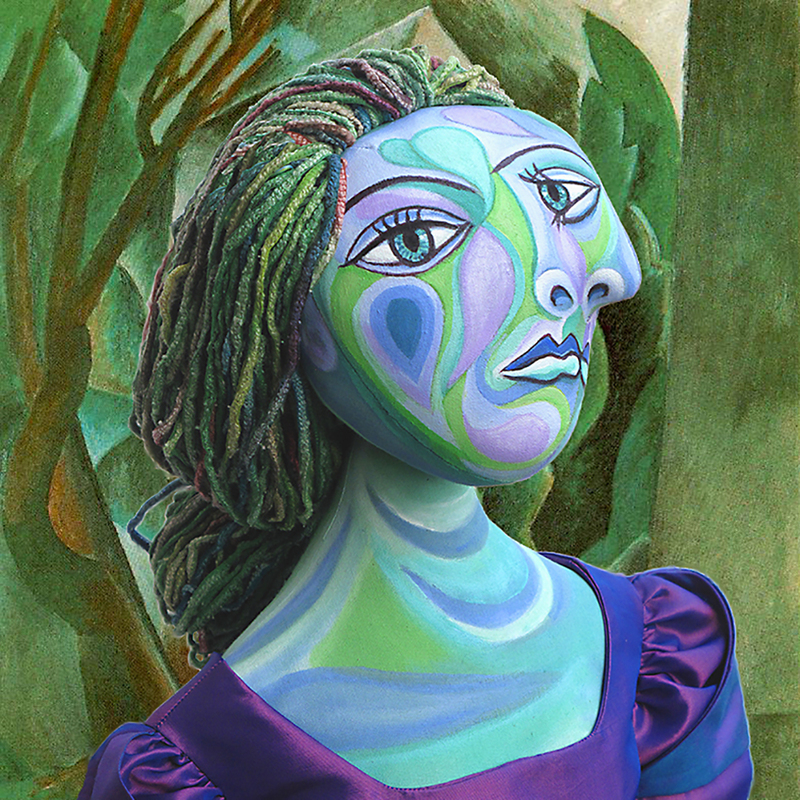 In creating Marie-Thérèse as one of my art muses I have modelled her directly from Picasso’s painting, “Woman with a book”, 1932. Marie-Thérèse muse, seated in front of Picasso’s painting of her, “Femme avec Livre”, 1932. Here as with many of Picasso’s portraits, Marie-Thérèse is not portrayed as the blond haired beauty, but in an abstract burst of colour, exuding warmth and vitality. She is presented as a green and white haired woman seated on a comfy red armchair, holding a fan-like book and wearing her breasts on the outside of her dress. There appears to be a balance of sensuality and restraint in Picasso’s bold and colourful representation. The calm contentment and sweet nature of Marie-Thérèse can be sensed in her features and composure; while her colouring does not diminish her serenity. 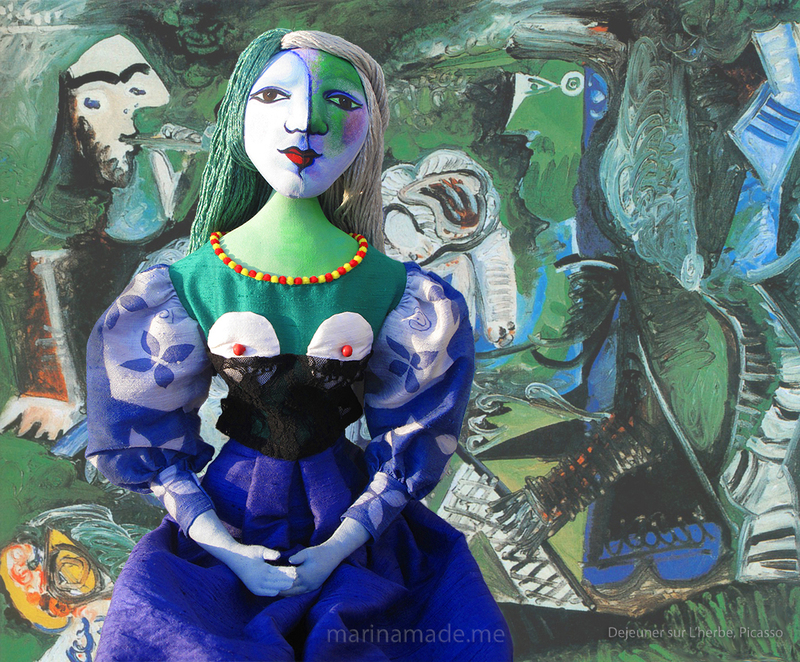 Detail of Marina’s art muse, Marie-Thérèse, with Picasso’s painting of her. “Femme avec Livre 1932”, a portrait of Marie-Thérèse, by Picasso. Her profile can be seen in the mirror behind her. 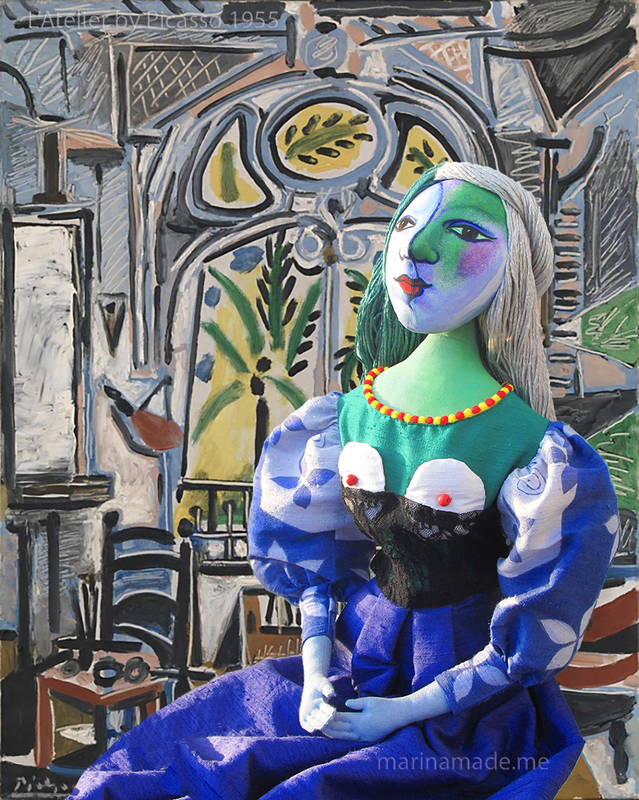 My muse Marie-Thérèse, set against Picasso’s ” Dejeuner sur l’herbe”, after Manet, 1959. Picasso was in his mid-forties and married with a young son, when he met Marie-Thérèse Walter in 1927. The seventeen year old Marie -Thérèse was standing outside the Galleries Lafayette department store in Paris having bought herself a Peter Pan collar, (which would later appear in some of her portraits). 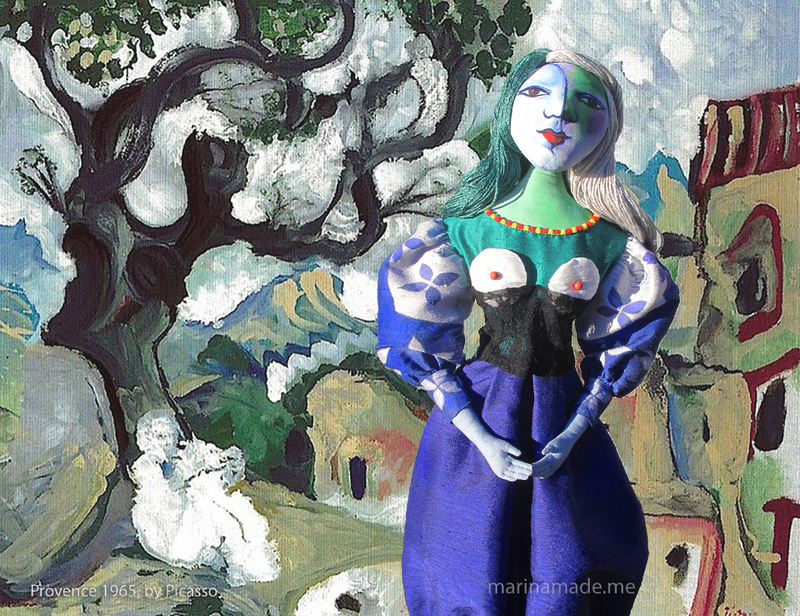 Picasso, who was instantly drawn to her beauty, boldly introduced himself and said,“Mademoiselle, you have an interesting face, I would like to paint your portrait. 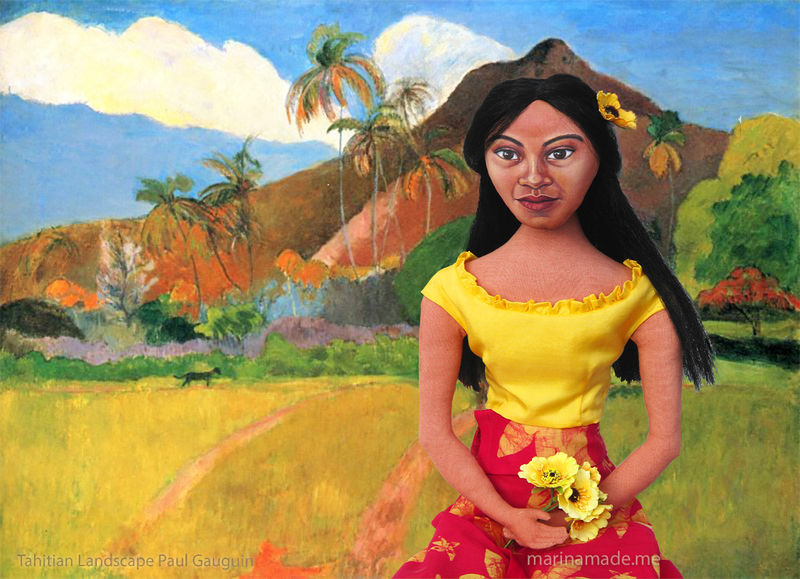 I am Picasso.” She may not have been aware of who he was or how famous he may have been, but she was flattered and agreed to his proposal. 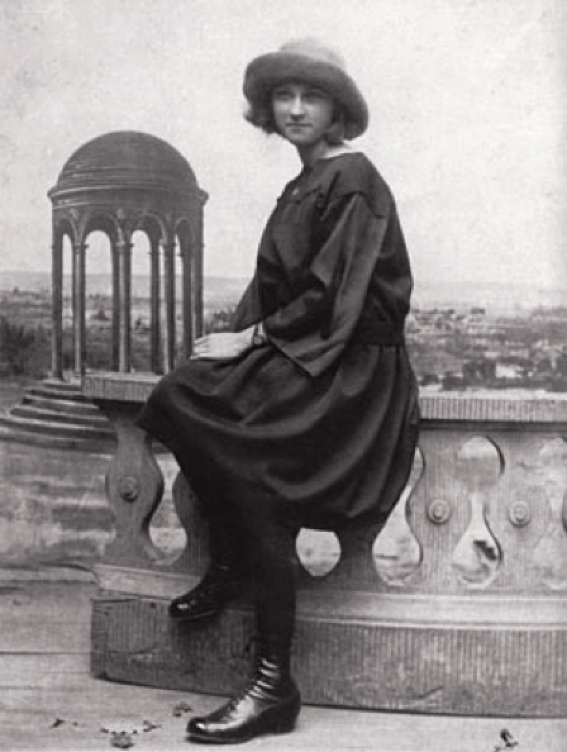 The young Marie-Thérèse in Paris. 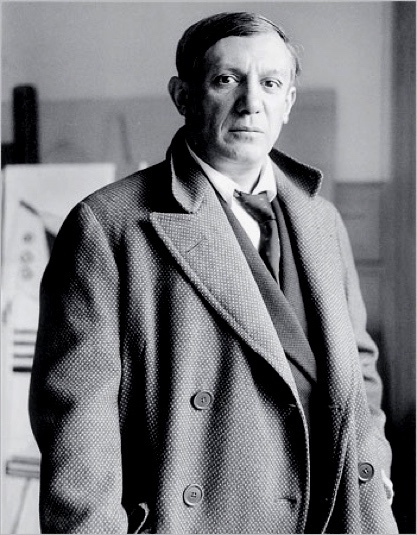 Picasso in 1928, soon after meeting Marie-Thérèse in Paris. Marie-Thérèse lived in the suburbs with her mother and two sisters and had some family obligations but was otherwise at Picasso’s disposal. To explain her daily absence, she told her family that she had a job in the city. Over the following months, the two spent a great deal of time together, mostly in the studio where Marie-Thérèse usually passed the day reading or dozing while Picasso worked. 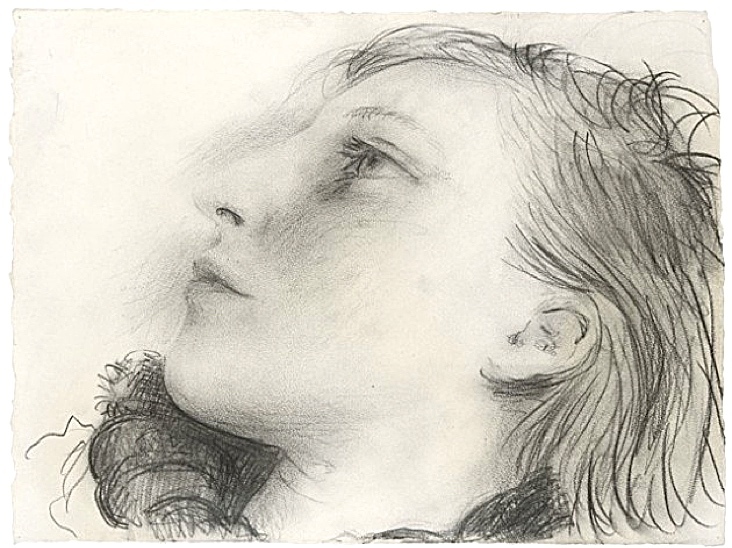 Pencil portrait of Marie-Thérèse, 1935 by Pablo Picasso. 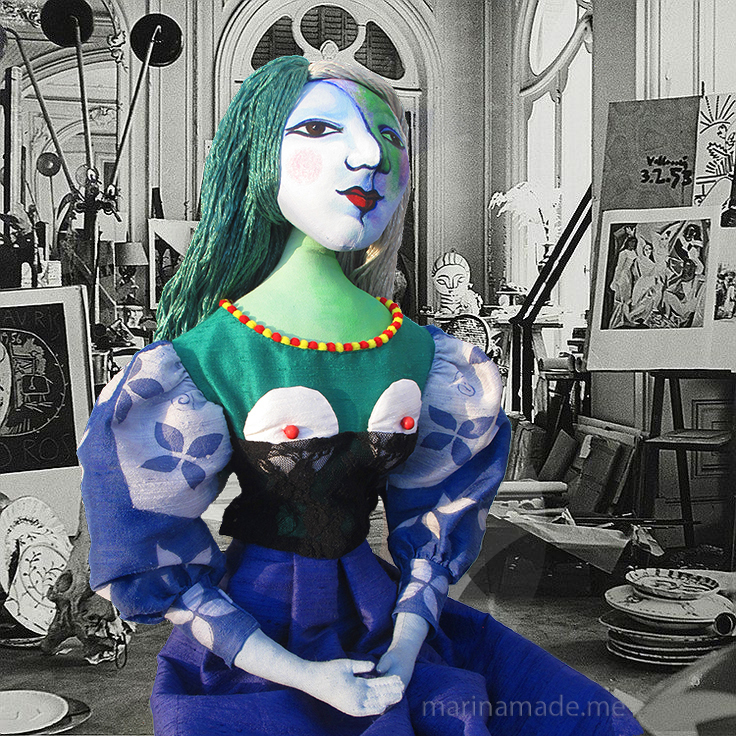 In a short time Marie-Thérèse became Picasso’s primary studio model and muse and an intense relationship began. 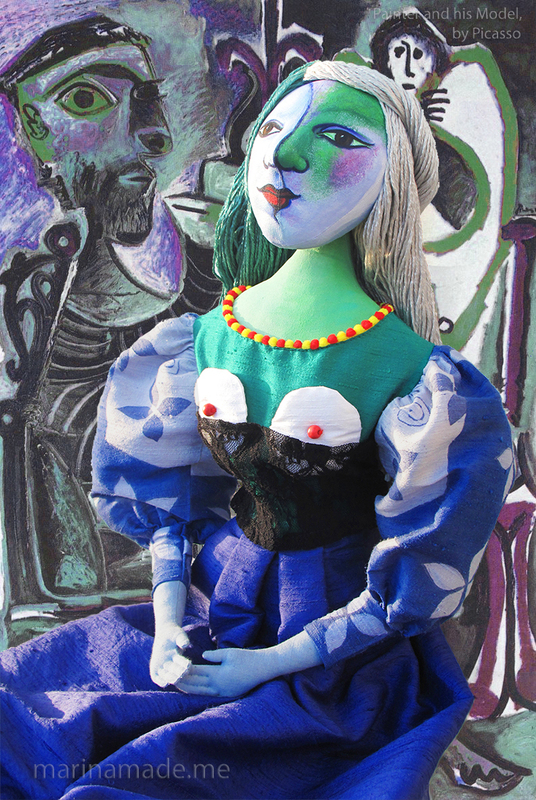 They soon became lovers, but because Picasso was married and she was at that time a year under the age of consent, he kept his romantic relationship with her shrouded in secrecy. It was several years later in 1935, after Marie-Thérèse became pregnant and gave birth to their daughter, Maya, that their affair was finally revealed. 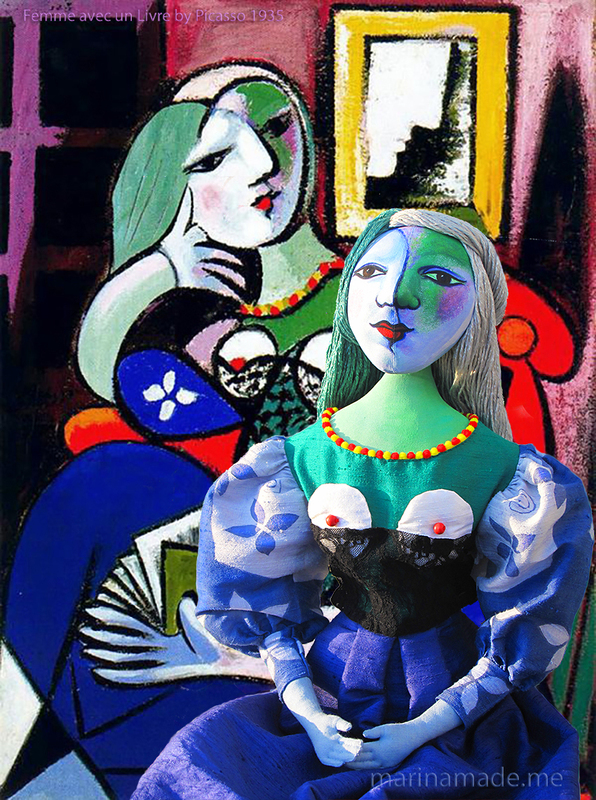 Picasso was utterly captivated by Marie-Thérèse’s youth, beauty, and vitality. 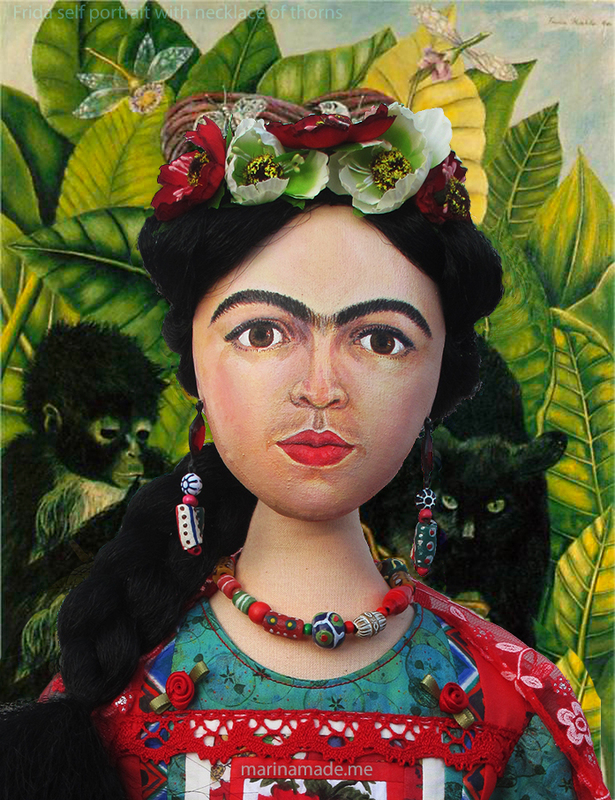 Her distinctive features appeared in countless art works. Between 1927 and 1939 he created hundreds of drawings, paintings, prints, and sculptures referencing her flaxen blond hair, Grecian profile, and soft voluptuous figure. Their passionate and slightly rebellious affair had the effect of freeing Picasso from the analytical, abstracted forms of Cubism to the sensual, energetic, and exploratory figurative work that became his trademark. 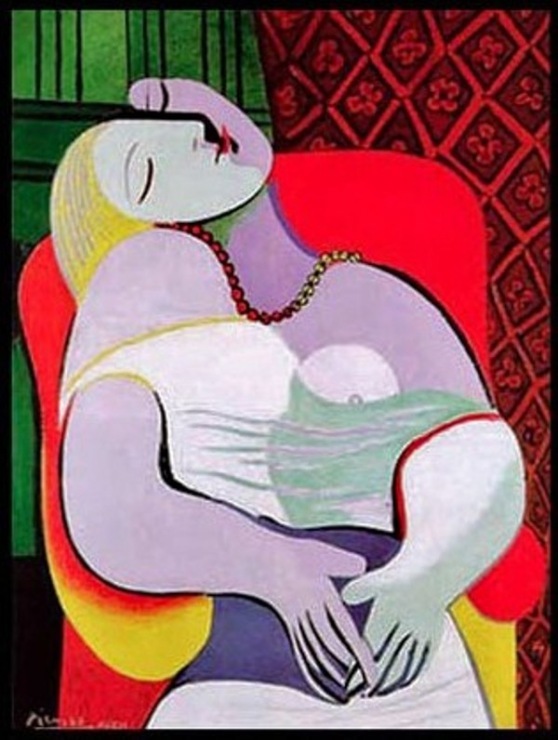 “Woman with Yellow Hair”, 1931 by Pablo Picasso, depicting Marie-Thérèse asleep. “La Lecture” by Picasso, 1932, showing his lover and muse Marie-Thérèse asleep. 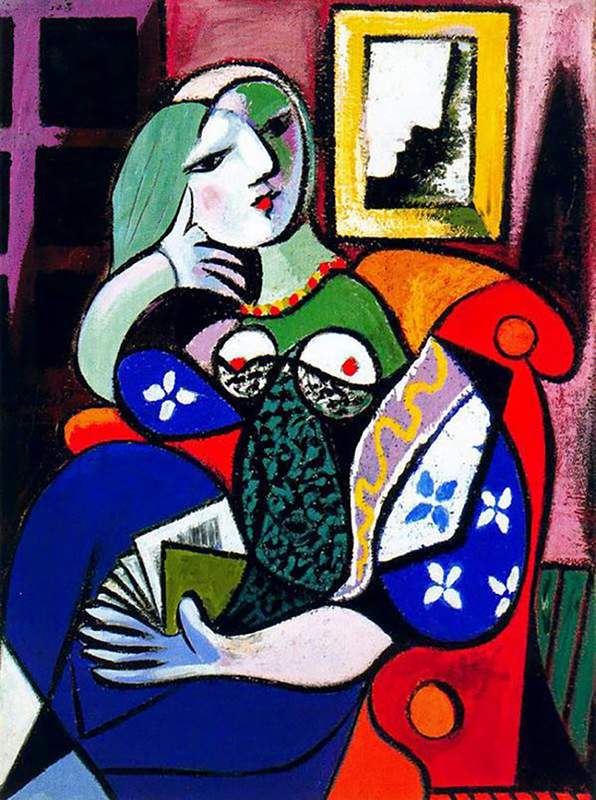 “Woman Reading” 1932, Pablo Picasso. “Le Reve”‘ or ‘the dream’, by Picasso, 1932. 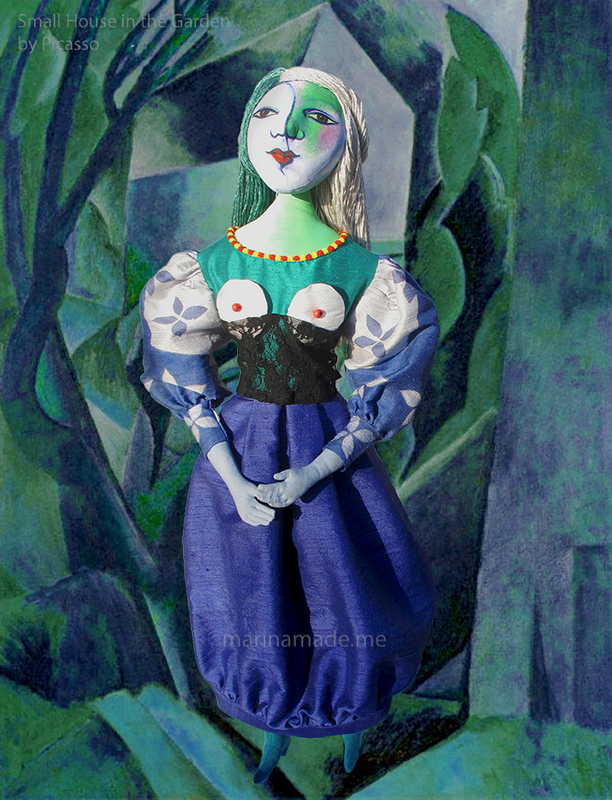 Some say you can see a phallus on the top side of her face and that Marie-Thérèse was dreaming of Picasso. Marie-Thérèse has often been described by biographers as sweet, submissive and affectionate. 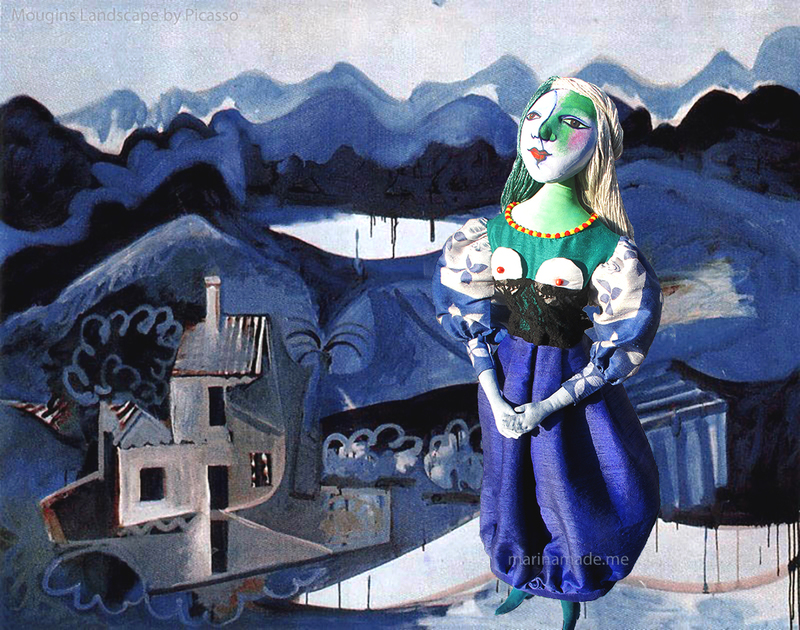 Her childlike innocence fuelled Picasso’s desire and provided a sharp contrast to his unsettled family life. 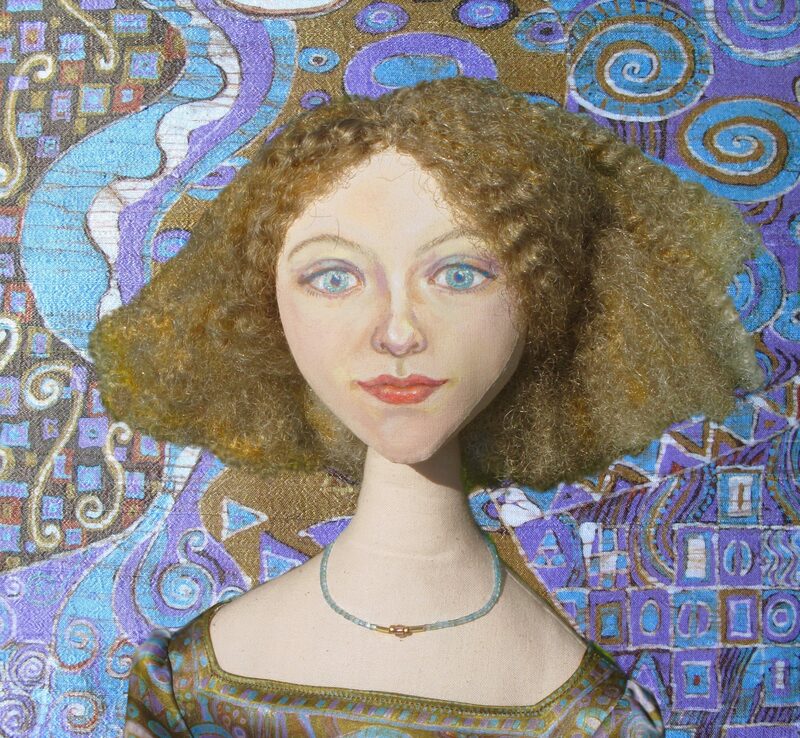 His wife, Olga Khokhlova was a former ballet dancer from Ukraine. She suffered from anxiety, which led to frequent emotional outbursts and stress; she was also extremely jealous and possessive. Picasso’s life style and social status were very important to him and despite her resentment, Olga maintained their genteel, bourgeois way of life and Picasso preserved a role of respectability. Picasso kept their liaison a secret from family and friends over the following eight years. He enjoyed the challenge of keeping Marie-Thérèse accessible yet concealed, and became more daring over time. After a few years, he installed his lover in an apartment across the street from his family home! The ploy continued until 1935, when his wife, learned that he not only had a mistress, but she was six months pregnant. 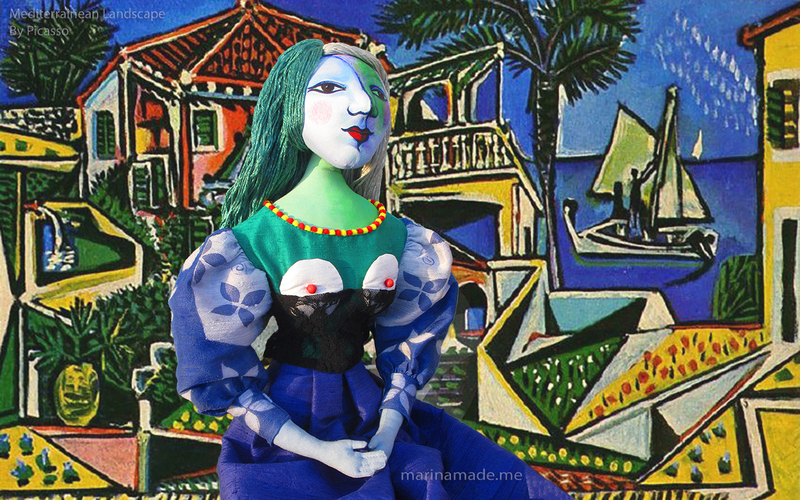 She immediately left Picasso and took their son, Paulo. Despite the fact he had brought this turn of events upon himself and had been unhappy in his marriage for years, Picasso agonised over the loss of his respectability and his son. 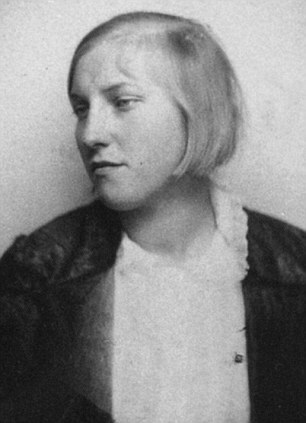 The resulting legal battle was contentious and difficult, so finally, it was decided that they would not legally divorce and remained married living separate lives, until Olga Khokhlova died in 1954. For a time after their daughter, Maya was born in September 1935, Picasso and Marie-Thérèse shared informal living arrangements. During his tempestuous marriage Marie-Thérèse’s unassuming and yielding personality provided a haven to Picasso, however her lack of intellectual enquiry and spirit became problematic once he was alone with her. A few months later, Picasso began a new affair with the accomplished and beautiful avant-garde photographer Dora Maar, who was his equal in drive, intellect, and passion. 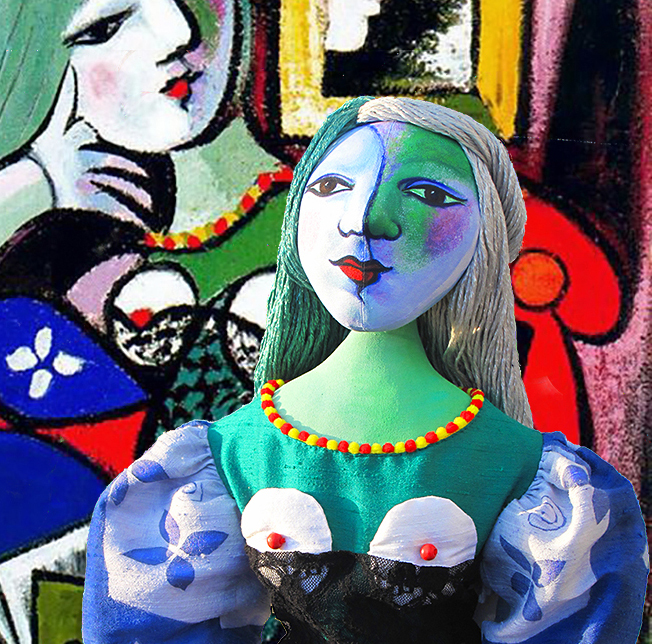 Obviously Marie-Thérèse was jealous of Picasso’s new lover but she remained devoted to him throughout her life. 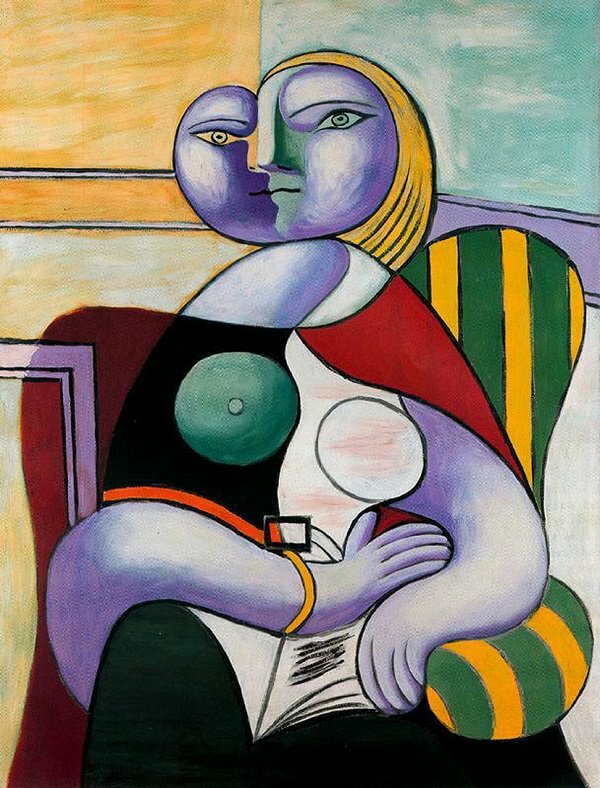 Picasso continued to paint Marie-Thérèse into the 1940s and although they never married he, supported her and Maya financially throughout his life. 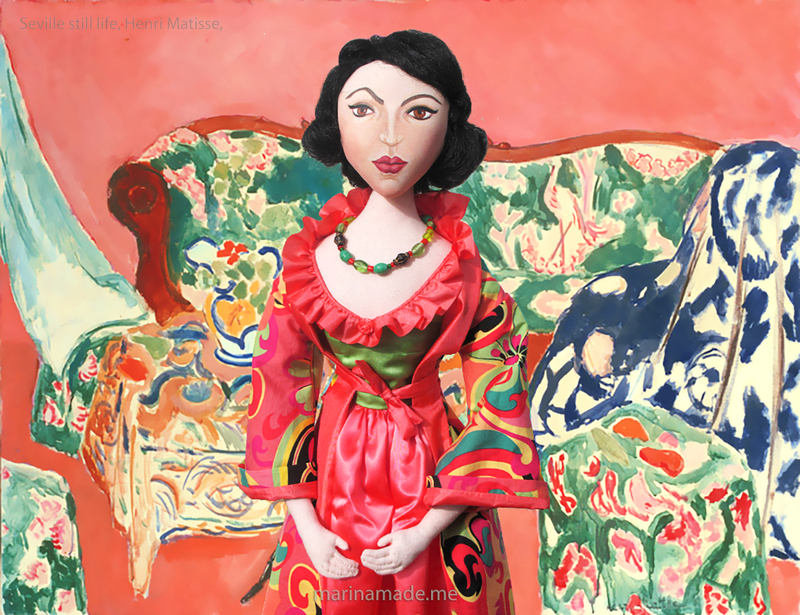 After parting with the artist, Marie-Thérèse suffered greatly, waiting for him to return. They corresponded, he visited Maya, but they were never together again. 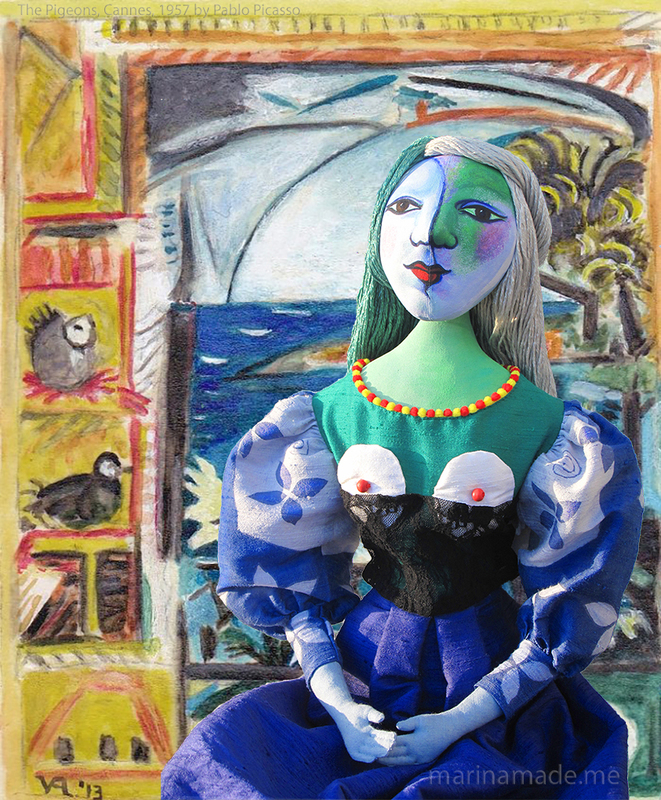 In 1977, four years after Picasso’s death, Marie-Therese committed suicide by hanging herself in the garage at Juan-les-Pins, South of France. 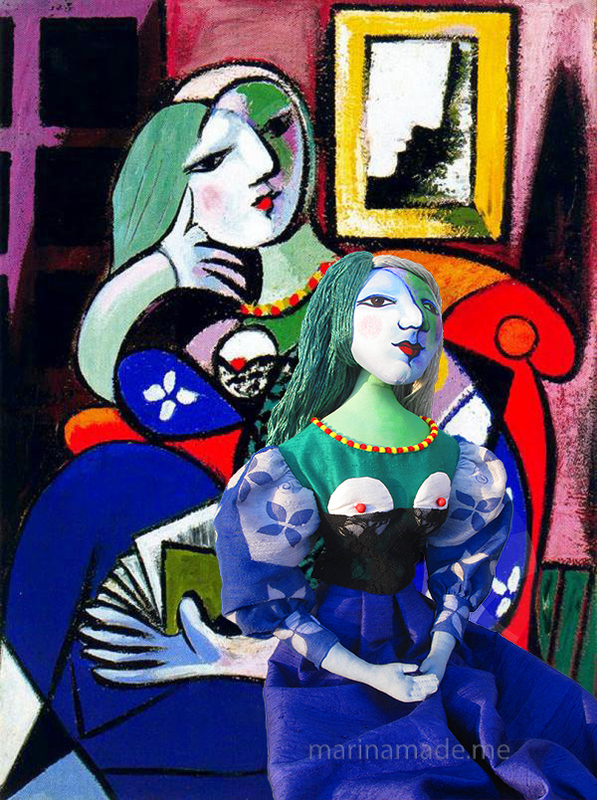 Marie-Thérèse muse perched aside the painting that inspired her,”Femme avec Livre” by Picasso. 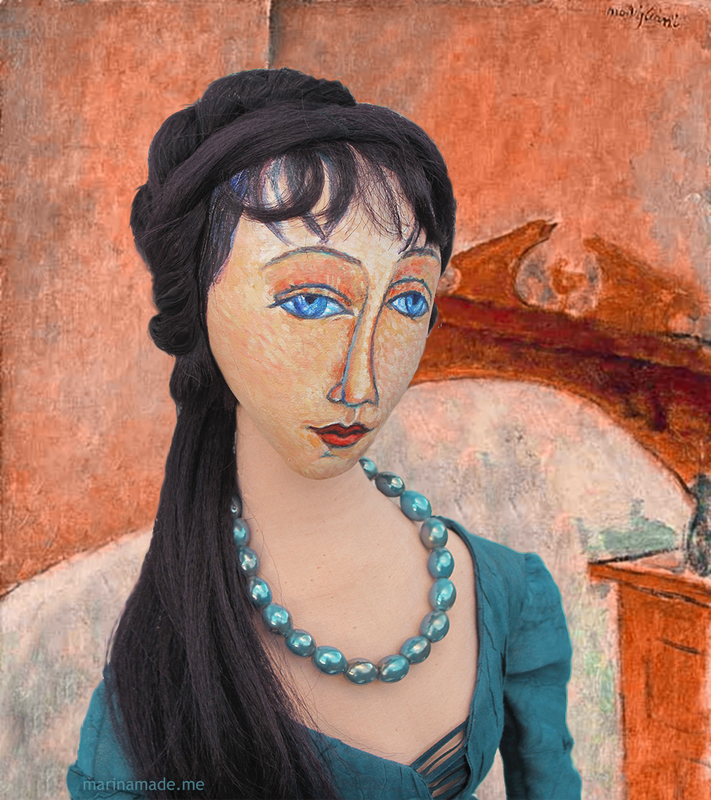 Marie-Therese Muse inspired by Picasso’s paintings of her, she is set in several of his paintings above. 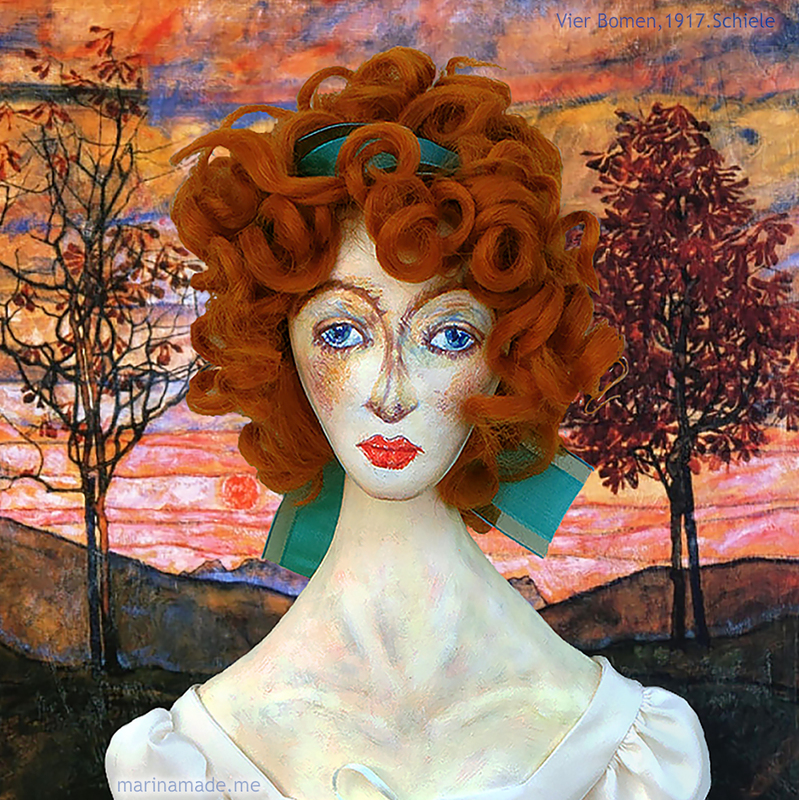 The soft sculpted muse was made by Marina Elphick.